Welcome to Bessels Green Baptist Church, Sevenoaks. 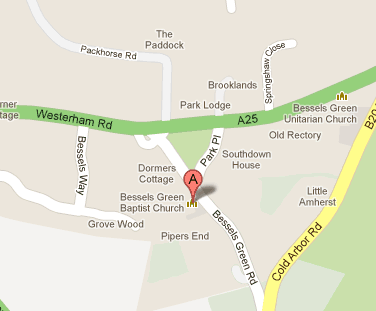 We are a vibrant and friendly church family that meets on the outskirts of Sevenoaks, in Kent. From the youngest to the oldest, we are a group of real people, seeking to learn more about God, love more like God and to share our God with the local community. Whether you’re completely new to church, new to the Sevenoaks area, or just haven’t been to church for a while, we’d love to meet you. Our main service is on a Sunday morning at 10am and you can be assured of a very warm welcome when you arrive.